Edit: Google have recently updated their terminology from Visits to Sessions and Unique Visitors to Users. Continuing on from last week’s post about Bounce Rates, I thought this week I would look at clarifying the difference between a Visit and a Pageview; and explaining how these two metrics can help draw valuable conclusions for the optimisation of your site. As with last week, I’ll assume that you have Google Analytics all nicely set up, and configured on your website, and that it’s tracking your users’ actions on your site correctly. Each time an individual lands on your website it sends a little message to Google to start a Session. This is tracked as a single Visit. Within the session, all the activity that the User carries out is tracked. The session will end after 30 minutes of inactivity, and after that, if the same user returns, it will count as another Visit. So while a user is on your site, and Google is quietly observing their actions, they will most likely look at different pages on the site. Each of these is a Pageview. 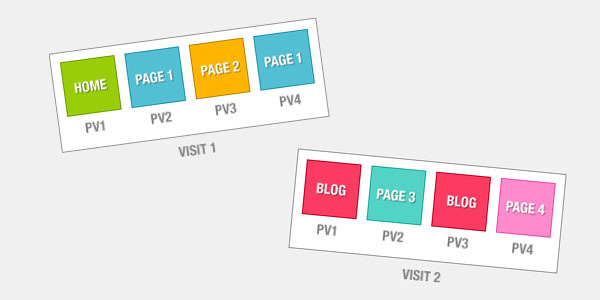 Now that we all understand the basic difference between a Visit and a Pageview, it’s worth explaining how these change when we talk about Unique Visitors, and Unique Pageviews. For argument’s sake, lets say your lovely GA report shows you have 10 Visits, and 6 Unique Visitors. 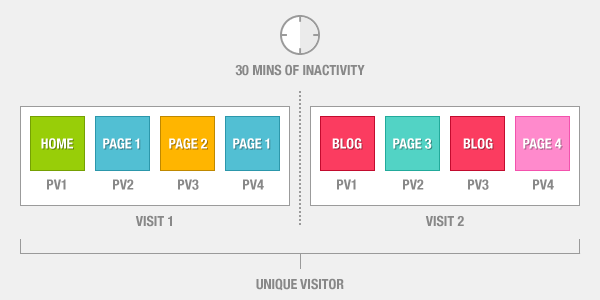 All this means is that you had six indivduals Visit your site, and between them they logged 10 Visits. So that could mean, for example, that 5 users visited your site once, and the sixth was so taken with it after his first Visit, he returned a further four times. Winner. If a user visits your “About Us” page 10 times, and your “Contact” page twice, during 1 visit, Pageviews would be 12, and Unique Pageviews would be 2. If that same person came back for another visit and viewed the About page 10 more times,then Pageviews would be 22 and unique views would be 3. But the Unique Visitors would still show only 1. Well now that you, hopefully, have a better understanding of what the differences are between those metrics, you should now begin to see a wider panorama of analytic possibilities stretching out before you. Comparisons between these metrics allows for a much more informed understanding of user engagement on your website, with deeper insights into how your visitors are generally behaving on your site. For example, if you have a similar number of Visits and Unique Visitors, then you know that your users aren’t necessarily returning to your site, and you can begin to ask yourself why. the opposite of this; high numbers of Visits, but low unique Visitors would suggest a very loyal audience, but perhaps you need to work on promoting your site and increasing awareness. A high number of Unique Visitors, but low Unique PVs, infers that your site is widely published, and getting seen but that the content on offer isn’t highly engaging and you should consider why that is. Are you targeting the wrong audience? Is your site too hard to navigate? So there you have it folks, I really hope this little snippet of information has given a succinct explanation as to a couple of the basic metrics in Google Analytics, and has got you hungry to learn more. The items covered here, including bounce rates, are merely scratching the surface of the possibilities of Google Analytics, and as the weeks go on, we’ll be looking in more and more detail at the analytical power of this versatile and informative platform. Thanks. This explanation was useful!